Yes, I also think that the color composition of sprites and backgrounds is not harmonic in every aspect. I will try to adjust the color combinations again when all animations are done. One thing to consider here: Single blue pixels are much dimmer on the C64 than concatenated clusters of blue pixels. 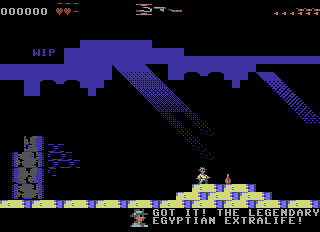 (see screenshots of the C64 emulator in some previous post) I have failed to utilize that until now, though. About the "green cave": I see what you mean here. Might have to address that, too. Not so easy. @PypeBros: Aww, that's right. Hmm... Ok, I might have to add whip- and gun-attack while in crouched stance. (That works in Castlevania) Still, the snake is too small, yup. Hi again... Yes, the project is still alive. I stumbled over some problems in the background again while creating the map with the tilemap editor. 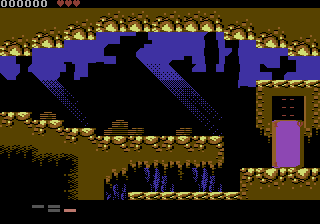 The tiles are limited to 256 for one room, so I had to build the background with reusing tiles. > Any inspiration for the nasty elevators and the randomly-triggering traps ? I really like the new background rocks. The green things in the bacground, with unique stripes, feel a bit awkward (Maybe they'll work better on a CRT display). To be hoset, I'd keep those "background vines" in their previous brown shade. If they're non-interactive, that will even make sense that they're "old and all dry now", so not safe for climbing action. How about making those mushroom-things either brown as well, and using a sprite for the one on the level that you really want to stand out ? The modular rock formations look pretty ace! 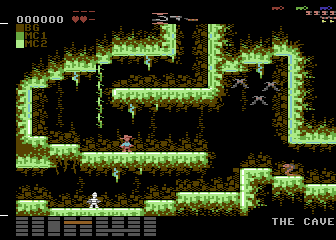 very crisp though; you could mess 'em up a bit for texture, perhaps re-using dither blocks? I'm with Pype that the chunkier, more stylised beams (like on the right in the previous iteration) are nicer. The green platforms look a lot more solid To the fuzziness: maybe you could go the black for more substance, the bits of red are getting lost a bit. The wide pixel dither/faux scanline stuff I think are pretty sweet, toothsome unifying textures, and communicate non/interactive rather well imo; I like the vines there. The new organic bark-y bg texture is great, but perhaps some of the chunkiness of the previous could be brought back for variety? I'm not keeping up well with the restrictions though . If each 2x2 area has the same block color, then I can use a more efficient scrolling code. (I need all CPU time I can get for the game mechanics) Seems like I can rearrange most of the graphics without major loss of detail. In the title pictures, this means that the pyramids in the background lost a color and they had to be moved a bit. And some red blocks in the bottom have to be grey. Not that bad. In the green cave rooms, the vines cannot be build out of hires blocks, because the green cave uses a reverse mode. 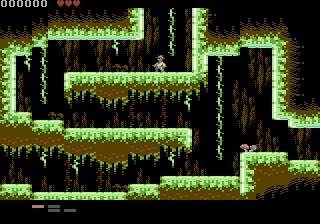 (the background color is brown here, so all hires blocks have to be brown in reverse mode) So I have to build the vines out of wide pixels. C: new status display (3 x-zoomed sprites + 3 normal sprites on top)... meh... I don't know... Any hits for a status display? All these workarounds could be avoided by tricky programming. 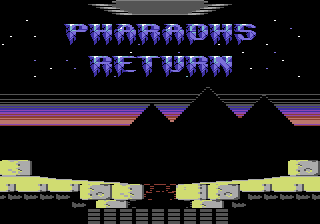 (And some C64 games are avoiding these) But sometimes, you have to be a lazy cow to save some time, otherwise you will never finish a project! Nothing much to say really except that I just noticed this, I love it, and now I'm looking forward to when it's done About the HUD, I like the third design. The thing that might be a problem is readability in terms of the gun, whip, and whatever the third item is (dynamite?). Very good stuff anyhows! Yay! I've been super excited for this for a long time. 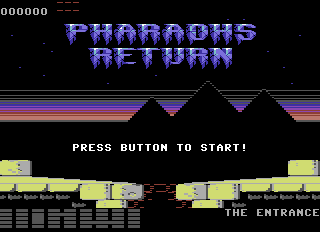 I do agree with the readability issues but there arent many ways you can get around some issues with the c64 palette. Just keep on trying I guess. I've seen games where the status moves away as the player approach this region.That could be an option ? (E) 6 sprites, all multicolor. 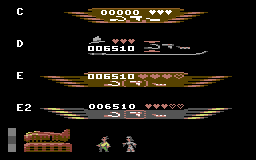 leftmost and rightmost sprite are horizontally streched.